New Delhi: Ailing Kingfisher Airlines, which cancelled more than 160 flights over the last six days, has been asked by aviation regulator DGCA to give details of their plan to reconfigure its fleet to prevent a large-scale flight disruption. Mallya, meanwhile, tweeted: “Every government has gone out of the way to support airlines and connectivity. In India airlines are overtaxed and overcharged. Wonder why?" In another tweet, he posed: “Is it Kingfisher’s duty 2 fly on loss making routes when state governments tax heavily? Or should v be financially prudent n fly profitably". Kingfisher, which has been cancelling over 30 flights each day since Monday, had on Friday cancelled 40 services across its network. DGCA, which issued a show-cause notice to Kingfisher in this regard, has also sent similar notices to IndiGo and SpiceJet and asked them to submit their cancellation details. “When the schedule for winter was approved, it was with immediate effect. So we took a stock of the position and on that basis, we asked them to explain," DGCA chief E. K. Bharat Bhushan said. He also warned that if the airlines were found not operating the slots allotted to them, these will be given to others who are willing to operate “regardless of who it is". As its shares crashed to a record low amid continuing debt fears, beleaguered Kingfisher sought government’s intervention to help it restructure its finances. Kingfisher is understood to have sought about Rs300 crore of funded limit and a similar amount to secure Letters of Credit as well as bank guarantees. 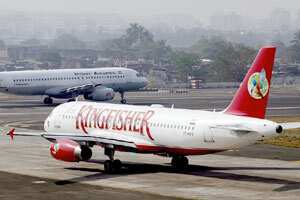 Kingfisher is also believed to have sought soft payment options from oil companies for jet fuel. However, official sources said, “No bailout was being granted to Kingfisher by the government." The sources said the airline was free to approach the concerned ministries on issues concerning soft loans and for restoration of the credit line from oil PSUs for the uplift of jet fuel. Civil aviation minister Vayalar Ravi had on Friday said the entire aviation industry needed help especially to meet the crisis caused by rising jet fuel prices. Ravi’s comments drew sharp criticism from BJP leader and former finance minister Yashwant Sinha, who said there was “no case for a government bailout for Kingfisher. We cannot support such a step." Congress spokesperson Manish Tewari said it remains to be seen whether in a market economy the government will walk the extra mile to bail out a private company or should allow the shake-out to take place and the fittest to survive. While Kingfisher officials were closeted with their legal and financial advisors till late last evening, the airline’s lenders have also begun deliberations to consider if the struggling airlines’ debt could be restructured. Overall, banks, including SBI, ICICI Bank, IDBI Bank and Punjab National Bank, have an exposure of Rs7,700 crore to the airline. The stocks of the airline had on Friday plunged to an all-time low to 19.1% in early trading on the Bombay Stock Exchange to a record low before recovering to 9.45%. The airline has suffered a loss of Rs1,027 crore in 2010-11 and has a mounting debt of Rs7057.08 crore.